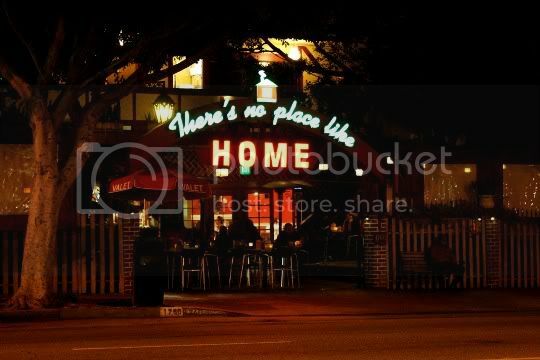 "There's no place like home"...such a cute, quirky, innovative idea for this festive Los Feliz restaurant. 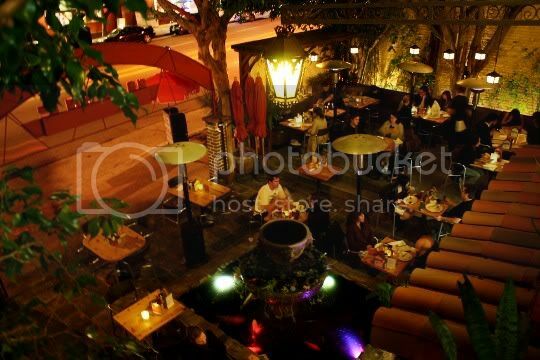 The majority of Home restaurant is actually outdoors, making you feel as if you're dining in some backyard bungalow, complete with koi pond, fountain, and tiki bar. When I visited Home, the horrible odor of cigarette smoke infiltrated my surroundings. Thankfully, a new ordinance has since passed which now bans this atrocity; a great thing since most of the dining and fun takes place outside. One remaining problem with the outdoor seating, however, is the mass of huge trees that hang overhead and occasionally pelt you with their seeds. If you're lucky enough to actually grab a booth, you're more than likely protected. 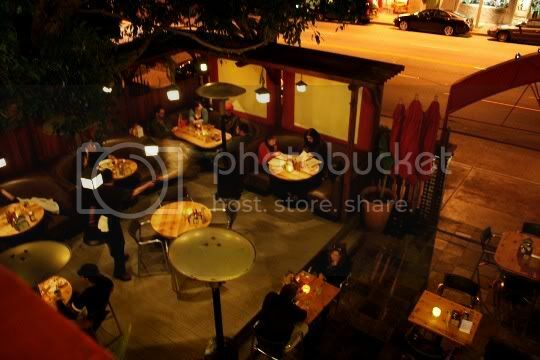 The overall decor is fantastic: cabana-style seating, hanging lanterns giving off warm and cozy lighting, and (working) heat lamps for cold nights, all fenced in like a huge backyard. Don't worry, there is some indoor dining...and it looks just like you're in someone's home. A small, red dining room is good for intimate parties, and may cut down on some of the noise from the outside area. A word of warning: depending on the night, service can be a bit questionable...or flat out confusing. Both times I visited Home, I just sort of walked in and sat myself. There was no host at the entrance, only a few wait staff, and a couple busboys bustling around. However, there's a multitude of valet attendants waiting to stiff you for parking; don't do it, there's plenty of nearby street spots. For those of you who like to get your buzz on, Home has an unbelievable drink menu, from fruity and tangy martinis and cocktails, to rich and decadent latte drinks. Surprisingly, their beer and wine selection is a bit limited, but they've at least got the usual suspects. 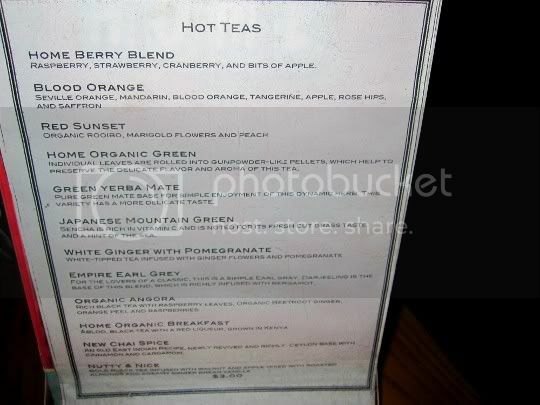 For the tea drinkers, they've got an amazing assortment of fruity herbal teas that are probably big sellers during breakfast and brunch hours. Lawd lawd lawd...can we say sugar-inducing mouth pucker and wince face? This drink is STRONG...both in alcohol and sugar. 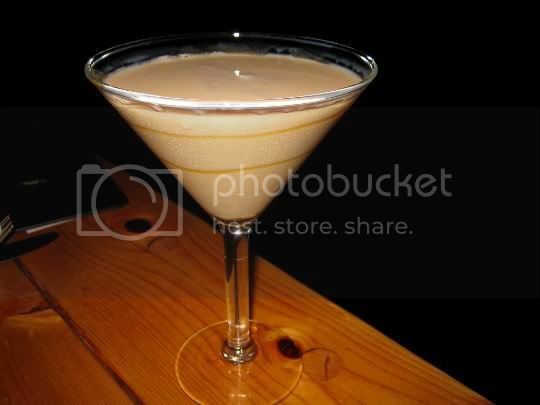 Caramel-flavored vodka pairs with coffee cream liqueur in a drink that is absolutely screaming for some watering down. I mean, it's sweet to the point that it tastes syrupy. Now don't get me wrong, the drink tastes GOOD...but just beware. I wouldn't be surprised if all of the latte martinis are similar (not that that's going to stop me from trying them LOL). This hot steaming soup definitely lives up to its name: it's chockful of hearty vegetable chunks (carrots, zucchini, and celery), very tomatoey, and has that homey comfort food feeling. It's perfectly seasoned with an empshais on basil and thyme, and also contains sweet, juicy corn kernels. The puree itself is surprisingly very sweet, but the salt and savoriness of the veggies nicely balances it out. The soup was served just hot enough to enjoy on a cold night, and I could easily see making this a meal with maybe one other appetizer. I'd definitely order it again. 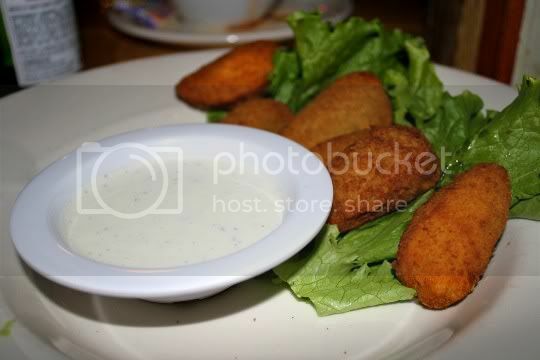 These are your standard restaurant poppers: crisp on the outside, molten hot and gooey-cheesey on the inside (and of course, served with cool ranch dressing). What I did like about these--and what was noticeably different--was the breading. The menu calls it a "light potato breading," but the flavor and texture of it immediately brought something else to mind...Cheez-Its! That's right, those popular delicious cheddary, crunchy crackers. I'm not sure if they actually use them and add them to the coating, but it certainly tastes that way. There's also a nice even layer of the breading, and whoever battered and breaded them did a superb job. Hey, that's important for frying! So as I mentioned above, Home has a soy chicken option on the menu. In theory, it's probably available as a substitute in all the sandwich/burger/salad options, although that isn't really stated on the menu. 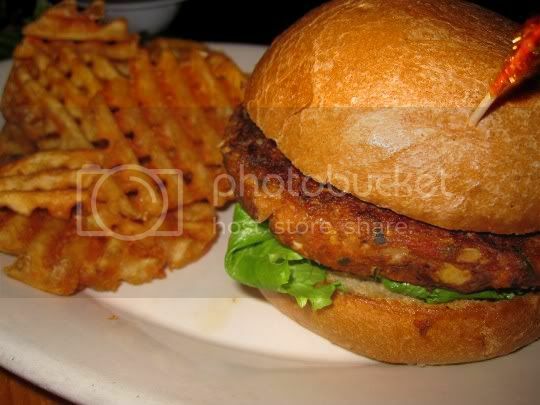 Same goes for the veggie bacon (which I believe is Morningstar). Therefore, I opted for this sandwich which sounded like a simply delicious combination of ingredients. The chicken isn't Gardein, like I assumed it would be. Actually, I'm not sure what brand it is, but it tastes very similar to Follow Your Heart. Anyway, it's breaded, hearty, thick, massive, and super tasty. The veggie bacon adds saltiness, the avocado adds that unmistakeable buttery creaminess, and the lettuce and tomato add crunch and sweetness. The Swiss cheese is a bit much, I think; in fact, it adds to the already somewhat greasy sandwich. The rye swirl bread that houses the sandwich is also greasy, but it's crisp and sturdy enough for its contents. I barely tasted the basil aioli, but that's probably because the three main ingredients provide most of the flavor (which is fine). 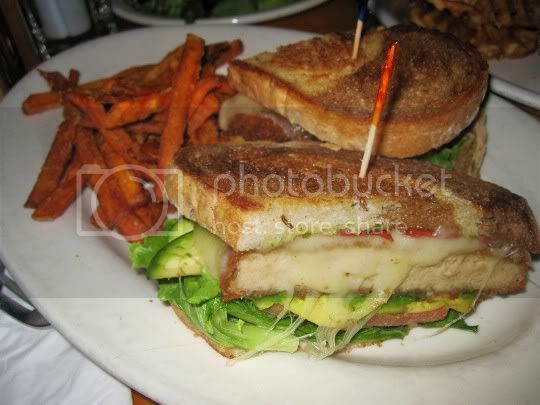 I'd order this sandwich again (sans cheese)...and I'd definitely try the soy chicken on the other menu options. Oh yeah, and the sweet potato fries were great. Crisp, not overly seasoned, and perfectly sized. Holy cucumber, what a huge portion! 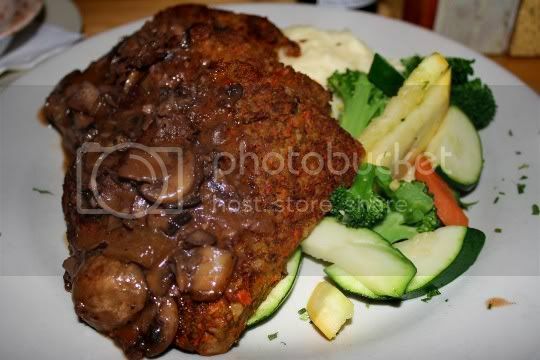 Unfortunately, it isn't what you're probably expecting from a veggie meatloaf: this is the non-faux meat version (I was hoping for at least some soy crumbles or grounds). The outside of the slices are firm, seared, and slightly crisp on the edges; the inside, however, is sort of a soft mashed bean/veggie/grain blend. Which isn't a bad thing, but just not something I'd want in meatloaf. Anyway, you can definitely taste the bread used for binding, and there's a heavy thyme and parsley emphasis...that being said, it's flavorful yes, but not very well seasoned overall. But as I mentioned, it is a HUGE portion, and I was full after just a few bites. In fact, I think the leftovers were actually better. Now the mushroom-red wine gravy, on the other hand, is out of this world! 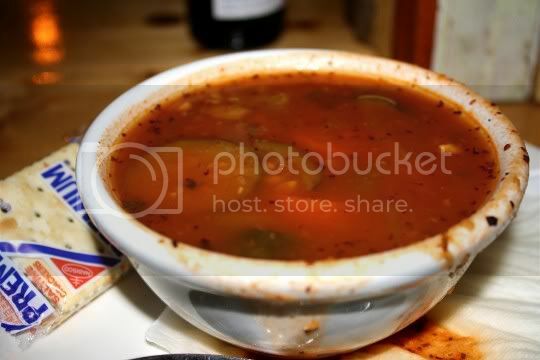 Tangy, earthy, rich, bold...and best yet, you can tell vegetable stock is used for the base. You may want to even ask for another serving of the gravy, it's that good. I found myself wishing I had more to drown the meatloaf in. As for the sides... The steamed veggies (carrots, broccoli, zucchini, and yellow squash) taste like tap water, are barely seasoned (if at all), and are way too firm to be called steamed. The garlic mashed potatoes, however, are quite tasty. They're salty, creamy, and super buttery...a little too thick and sticky, but again, great as leftovers with the meatloaf. Although the portion sizes were huge and the flavors of everything decent, I probably wouldn't order this again.